After gold’s plunge on Thursday, it made a comeback attempt on Friday. But that erased only half of Thursday’s vigorous decline. The situation in silver and gold miners doesn’t provide much ground for optimism either. The silent scream we wrote about in the Wednesday’s Alert for our subscribers brought serious repercussions. Both immediately and step-by-step as in a trainwreck in slow motion. Either way you look at it, just in time for our subscribers to reap the benefits. Today, we will devote extraordinary attention to the USD Index and the 2012-2013 – today link in gold. In Thursday’s Part I, we shared with you the short-term check on precious metals sector health. In Friday’s Part II, we examined whether the most recent developments changed the long-term view anyhow. Those articles were a limited sample of exclusive care our subscribers get on an everyday basis. Today, we will follow up with even more of such a peek under the hood - another sample of what our subscribers already enjoyed on Thursday. Whether you are reading this article on our website or elsewhere on the Internet, we will now share today’s full picture with you, the visitor, on the USD Index including the Brexit tremors. On top, we will update you on the short-term implications of the 2012-2013 – today analogy. That will be the cherry on the cake. We’ll also treat you to Thursday’s summary that remains up-to-date also today. We already wrote about the running correction in the USD earlier on Thursday and the above chart shows what we saw happen during the previous big upswings. In 2010 and in 2014 (areas marked with green rectangles), we saw back and forth movement during which the USD Index still moved higher overall. These running corrections took place close to the middle of the rally, a bit closer to its start than to its end. Applying this to the current situation suggests a move much higher, above the 2017 highs – likely to the 108 level or even slightly higher, to the rising blue resistance line based on the 2015 and 2017 highs. The US debt situation was not much better in 2014 when the USD Index started its massive 20+ index-point rally. The USD Index is based on currency exchange rates and the latter are relative valuations of one currency vs. the other. Two biggest components of the USD Index are US dollar’s exchange rates with the euro and with the Japanese yen. With all the troubles related to Brexit, the EU debt, the recent dovish comments from the ECB, and Japan’s relentless money printing, it’s not a question if the situation in the US is perfect. It’s a question whether it’s better than in the Eurozone and in Japan (and to smaller extent in other countries). And it doesn’t seem that things are better in the EU and Japan than they are in the US. The logic of international money flows is that money goes there where it’s treated best – and the U.S. is still the best looking house in a bad neighborhood. And it can accommodate large international money flows due to the sheer depth of the Treasury markets. Take a look at the bond yield perspective – the Treasuries carry such yields that make them look like junk bonds when compared internationally. Or, negative interest rates anyone? The long-term outlook for the USD Index remains bullish and the implications for the precious metals market remain bearish. By the way, we promised to write a few words on Brexit. Many months ago, when the Brexit vote turned out to really be Brexit and not Bremain, we wrote that this doesn’t mean that the Brexit will really take place. The outcome of the vote was shocking to the authorities, which likely thought that this will simply be a formality that ends all the “let’s leave the EU” requests once and for all. And it turned out to be exactly the opposite. We wrote that the Powers That Be have a lot of aces up their sleeves and if there was one thing sure about the Brexit, it’s that it will appear that nothing bad happening happened as a result of the government. And our bet was that the Brexit will not take place at all. A lot of time has passed, a lot of discussions took place, and a lot has been done to change the views of the UK citizens. Now, the question remains, how to design everything so that it still looks like all the authorities did everything they could to be the best representatives of their voters. On the other hand, it’s hard to say what Parliament would hope to achieve with a delay. EU negotiators have made it abundantly clear there will no more concessions, whether on an Irish backstop or any of the other things Brexiteers find objectionable in May’s deal. There is no doubt the niggling hope among many that somehow Britain—having made such a botch of this initial effort—will drop the whole idea of leaving the EU, or at least put it to another plebiscite. What is the compromise? Another vote. Only that this time it will end with the “right” choice and this time the choice will never be seriously questioned, and it will be viewed as final. To be clear, there will be voices of opposition, but nobody will take them seriously. Of course, there are no guarantees that it will happen in this way, but that’s how I – PR – see it. How could gold react to the above? Initially some volatile short-term swings, but overall gold should plunge on the Bremain scenario, just like it soared on the Brexit vote. Bremain means more stability and it means that all the UK-related political turmoil from the recent years would come to an end. The implications of the fact that a second referendum is being openly mentioned are bearish for the gold price and for the rest of the precious metals market. All the Brexit saga can be considered kind of a geopolitical factor in gold price determination: the key takeout is that the effect of geopolitical concerns on the gold market tends to be overstated and of limited shelf life. Technical analysis is of a more lasting importance and we invite you to examine for yourself our Gold Trading Tips. Having said that, let’s turn to the promised analytical dessert – the update on the short-term implications of the 2012-2013 – now link. 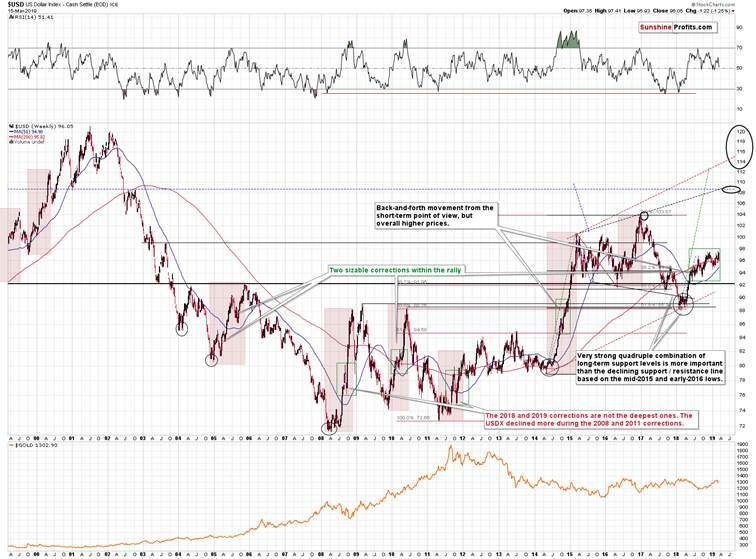 Based on how similar the situation is now to how it was in 2012 from both: broad and short-term perspectives, we previously created a series of target areas for gold. We wrote that these targets are just “default” values that will need to be adjusted as additional details become available. Wednesday’s rally and the subsequent unsuccessful comeback attempt on Friday was one of those details. Gold moved above its 50-day moving average – something that in 2012 meant that the initial sizable corrective upswing was over – it happened in late November 2012. After this top, gold declined until reaching approximately the 61.8% Fibonacci retracement based on the previous upswing, which corresponded roughly to previous local highs. Right now, the analogous price level based on these techniques is approximately $1,240. Does it mean that gold is likely to slide there shortly? It’s quite possible. However, it’s still possible that gold is actually repeating only the very initial part of the upswing that is about to take gold to the 50% Fibonacci retracement first – just like what we saw in early November 2012. The key difference between both rallies: the tiny late-October 2012 one and the bigger November 2012 one is the level that was reached and the sharpness of the initial decline. The initial downswing was sharper this time, which means that the initial counter-trend rally (just like the one that we saw in late October 2012) might have been also more volatile than the previous one. Therefore, the move above the 50-day gold moving average is not necessarily something that implies that the big corrective upswing is already over. That’s why we wrote that the move to $1,240 is only “quite possible”, instead of writing that it’s very likely. To be clear – it is very likely in the following several weeks regardless of the very short-term outcome, and what we’re discussing is whether we’ll see it really shortly (in a week or two) or not. The implications are that when gold moves to $1260, it may not necessarily be the best decision to enter long positions in gold. At least not without meaningful confirmations. If the USD Index is going to break above the 2017 highs and confirm this move shortly, then gold is likely to drop significantly before we see any corrective upswing. This may mean a move to at least (!) $1,240 before we see even a weekly correction. This would almost certainly not be the end of gold’s decline, but it could be a tradable opportunity to benefit from the rebound. At this time, we have two short-term scenarios that seem probable and they both end with gold at much lower levels, but the shape of the decline differs. It will be important to either monitor the short-term developments closely, or simply decide in advance to wait out any short-term strength while focusing on the bigger decline. As a default decision, we will stick with the trend that is most reliable (medium-term downtrend), but if we see strong bullish indications, we may enter a quick long position in the meantime. One more thing before summarizing. Our subscribers surely recall the gold chart that we featured on March 1st that had a different visual style than what we usually provide. We’ll share it with you, our visitor, now. 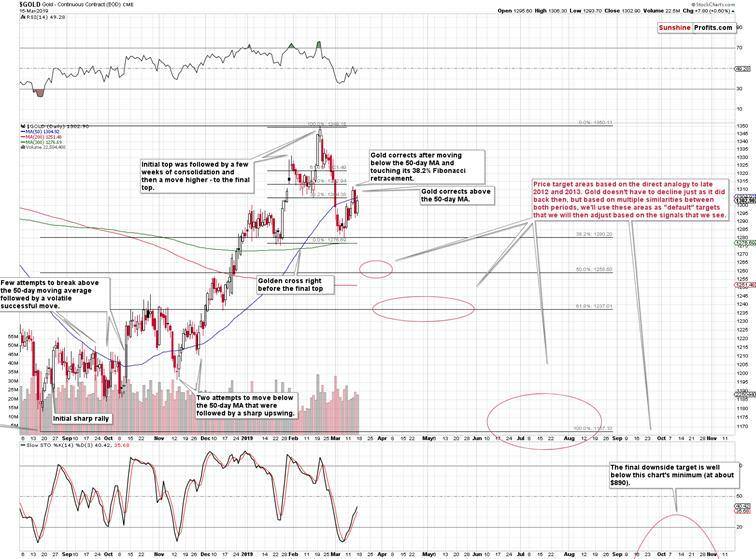 We put question marks on the above chart as what gold did might have potentially resulted in a head-and-shoulders top in gold. Gold moved below the green support area and we were right not to close the position at that time, but it turns out that the above might prove to be accurate in terms of shape and in terms of the H&S pattern in general. The right shoulder of the formation would be provided by the March upswing and the decline that seems to have started on Wednesday and continued on Thursday. Once gold confirms the breakdown below approximately $1,275, we’ll have a bearish head and shoulders pattern and the downside target would point to a decline to about $1,215. Naturally, the formation is not yet in place, so all the above is just a potential move. Pattern analysis forms an important part of the technical arsenal at our disposal. Still, this is yet another factor that shows it might be a good idea to keep the short position intact until strong bullish signs emerge to the contrary. Summing up, it’s almost certain that the next big move lower has already begun and that the 2013-like slide is in its early stage. Based on the updated version of the 2013-now link, the implications are even more bearish than we had initially assumed. The downside target for gold remains intact ($890), and the corrective upswing that we just saw seems to be rather natural part of the bigger move lower – not a beginning of an important move higher. And it seems that the corrective move higher in the PMs is either over or about to be over shortly. 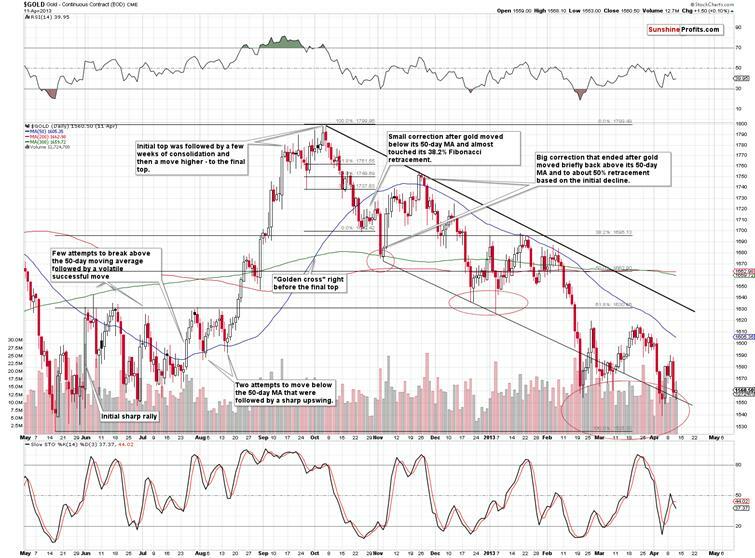 If you’d like to receive follow-ups to the above analysis, we invite you to sign up to our gold newsletter. You’ll receive our articles for free and if you don’t like them, you can unsubscribe in just a few seconds. Sign me up! Sunshine Profits enables anyone to forecast market changes with a level of accuracy that was once only available to closed-door institutions. It provides free trial access to its best investment tools (including lists of best gold stocks and best silver stocks), proprietary gold & silver indicators, buy & sell signals, weekly newsletter, and more. Seeing is believing.